Darnell Fisher is pretty philosophical when it comes to his season so far. The right-back was one of the stand-out performers as Preston North End finished seventh in the Championship last May. After a fine first campaign at Deepdale, the 24-year-old has struggled to match that this time around. He has played second fiddle to captain Tom Clarke for large parts of the campaign and has more competition in the shape of January arrival from Rochdale Joe Rafferty. But with the skipper injured, North End fans will be hoping Fisher’s performances in the away wins at Queens Park Rangers and Stoke are a sign of things to come. “I’ve never played in a team where I’ve been the only right-back,” he said. “At Celtic there were two international right-backs and I had to push them. “That’s football, there’s always competition. “You should have two players in every position really. “If Raff plays I’ll hope he does well and if I play I obviously want to do well. “We’re a team and you can’t want anyone to fail or anything like that. “The start of the season was a bit bitty but I think the whole team suffered with that,” said the Reading-born full-back, who has made 23 appearances in all competitions this season. “When we’re not picking up results the manager has to change something. “I think we went nine unbeaten in the league after I dropped out so you can’t really complain. “You’re annoyed that you’re not playing, as every footballer would be. You’ve just always got to be ready. “Anything can happen in football. There are freak injuries, you saw Chris Maxwell getting sent off at Ipswich and Paul Gallagher going in goal. “You’ve got to work hard on the training pitch and hopefully things will change. 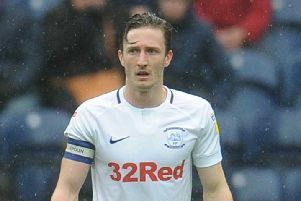 Fisher has started three of the four games so far this calendar year as PNE’s fortunes have begun to change ahead of Derby’s visit to Deepdale on Friday night. “We were disappointed with the FA Cup defeat against Doncaster,” he said. “But the two away games we’ve had have been really tough, especially with the way QPR picked up since we last played them. “Stoke is always difficult as well. “It was great to get the clean sheet against Stoke and score four goals against QPR. “Last season we had a good end to the season and hopefully we can do it again. “We’ve started off well in January, the two away wins are big for us and hopefully we can get another good result on Friday. “With the way Derby play and how they’re doing, it will be a tough game but we’re up for it. “We’ve just got to take it game by game from here on in and things can change really quickly.